Candy that is kosher in one country may not be kosher in another, so make certain to check. Fifty-one years ago on this day, October 28th, the Catholic Church officially stopped blaming the Jewish people for the death of Jesus. This ground-breaking statement came after more than a millennia of hatred, persecution and destruction that was far too often spurred on by the writings and preachings of the Catholic Church. The revocation of this centuries-old accusation was part of a document known as Nostra Aetate, “In Our Time,” that was issued during the Second Vatican Council (Vatican II) in 1965. Its title in English is “Declaration on the Relation of the Church with Non-Christian Religions,” and, as such, discusses the Church’s relationship with Hinduism, Buddhism and Islam. However, the section relating to Judaism constitutes about 1/3 of the document. What brought about this dramatic change? After the Holocaust, there was a great deal of soul-searching about how the world could allow the attempted annihilation of the Jews to take place. In 1958, Archbishop Roncalli, who had served in Istanbul during the war and was involved in saving scores of Jews, was elected Pope John XXIII. Having read the work of French Historian and educator Jules Isaac, who, just after the war, published his research on the underlying anti-Semitism in the Gospels and Church documents, Pope John XXIII realized the culpability of the Catholic Church in the Holocaust, and acknowledged that, at the very least, it provoked the underlying anti-Semitism of the populace. He appointed Cardinal Augustine Bea to research and draft a document dealing with the Church’s anti-Semitism. Pope John XXIII passed away in 1963, but his successor, Pope Paul VI continued the re-evaluation process, presenting the Nostra Aetete at the Second Vatican Council. Not only did this document revoke the accusation of the Jews killing Jesus and repudiate persecution of the Jews, it also recognized the Church’s roots in Judaism and the eternal, unbreakable nature of the covenant between God and the Jewish people. Begin following the weekly Torah portion as we begin the cycle of Torah readings anew this week with Genesis (Bereishit). Bring the focus of our relationship with the Divine from the holidays that just passed into mundane life. 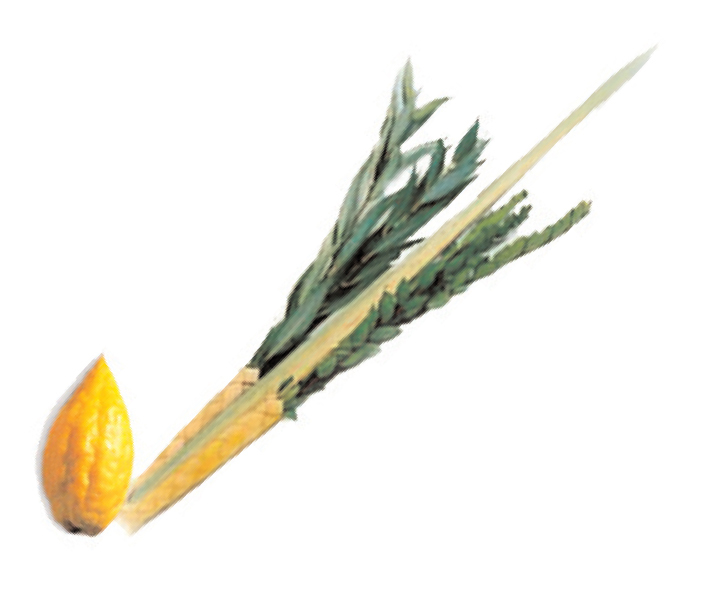 This Treat is reposted in honor of Isru Chag Sukkot. NJOP and Jewish Treats wish you a joyful holiday! Hoshana Rabbah 5777 begins Saturday night. If the weather permits, take your Shabbat nap in a sukkah. If you have a sukkah, invite Jewish friends, acquaintances and colleagues to join you in it for a meal. If you do not have a sukkot of your own, visit the sukkah of your local synagogue or Jewish center. Involve the whole family in decorating the sukkah. 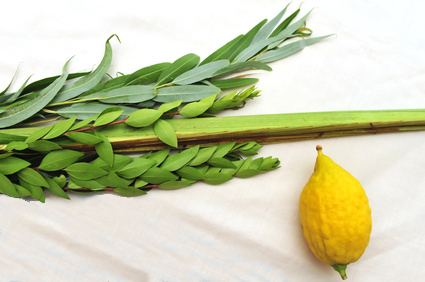 Collect long, thin branches to use for the roof of your sukkah. Contact your local synagogue about purchasing a set of the four species. In the “next world” a soul cannot grow spiritually, perform mitzvot or earn a better place. Basically, in the “next world” the soul reaps what it had sown in “this world.” However, a soul may gain merit through the deeds of its descendants. * During the festivals, the gates of heaven are already open to accept prayer, thus making it a perfect opportunity to add a special prayer for one’s deceased parent(s) or other family members. This service, known as Yizkor (“He shall remember”), is recited by Ashkenzim on Yom Kippur, Passover, Shavuot and Shemini Atzeret. Yizkor may also be recited for other relatives (grandparents, aunts, uncles, etc.). In many communities it is also customary to recite a special prayer during Yizkor in memory of those who perished in the Holocaust and those who fell defending the State of Israel. In fact, many speculate that the memorial service originated as a result of the Crusades, when tens of thousands of Jews were murdered. It is the custom among many Ashkenazi Jews that those whose parents are both still living leave the sanctuary during the service so as not to disturb the reflections and prayers of those who are reciting Yizkor. NJOP and Jewish Treats wish you a meaningful and easy fast. Yom Kippur begins this evening before sunset with the recitation of Kol Nidre, which is actually the prelude to the evening service. "God, if you’ll just forgive me for lying, I promise I will give $1 to charity every day." "Lord, if you could just look the other way at that nasty outburst the other day, I promise never to lose my temper again." Because vows may not be cancelled at night, the Kol Nidre service begins a few minutes before sunset. In Ashkenazi communities, the prayer leader begins the service in a soft voice that grows increasingly louder as the prayer is repeated three times. In this way, the haunting, dramatic tune of Kol Nidre sets a tone for the day and helps the congregation focus its concentration. In many Sephardi communities, Kol Nidre is recited by the entire congregation. 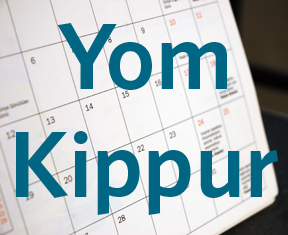 Make a list of things you would like to atone for this Yom Kippur. Fasting (No eating or drinking) - From sunset on the eve of Yom Kippur until nightfall the next day, it is forbidden to eat or drink. However, those who are ill, as well as pregnant and nursing women, should and, in some cases, must, eat on Yom Kippur, as decided by their rabbi in consultation with their doctor. In such cases the rabbi should also be consulted about specific details of eating on Yom Kippur. Additionally, girls below the age of 12 and boys below the age of 13 are not required to fast. "One who eats and drinks on the ninth, is considered by the Torah to have fasted on both the ninth and the tenth" (Talmud Yoma 81b). This principle is derived from a strange allusion to afflicting one’s self on the ninth of the month in Leviticus 23:32 ("... and you shall afflict your souls; on the ninth day of the month in the evening ..."), even though only 5 verses earlier the Torah commanded that we must afflict ourselves on the tenth (Leviticus 23:27). The seudah hamafseket is usually eaten after the afternoon service, closer to evening, but while it is still daytime. It is recommended that one eat only light foods which are not too salty (therefore it is customary not to eat fish at this meal) and to avoid intoxicating beverages. Different families have their own customs how to best celebrate the successful conclusion of Yom Kippur with a festive meal and "break fast." Many Ashkenazi families have dairy meals, while Sephardi families will eat a meat meal. To prepare for Wednesday's fast, drink more water and less coffee over the next few days. Put your whole heart into celebrating the first Shabbat of the new year.